This entry was posted in Academic achievements and tagged Goldwater Scholar on April 4, 2013 by Wire Eagle. 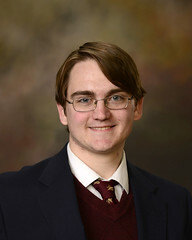 AUBURN UNIVERSITY – Patrick Donnan, an Auburn University Honors College student double-majoring in physics and music, has been chosen as a 2013 Barry M. Goldwater Scholar, an honor bestowed only to approximately 300 students nationwide each year. The scholarship is widely considered the most prestigious award in the United States for undergraduates in science, technology, engineering and mathematics disciplines. Donnan, an Auburn native, conducts research with Professor Francis Robicheaux as part of the theoretical and computational atomic physics group in the College of Sciences and Mathematics’ Department of Physics.